This page has specific info about the remaining intact or pristine (unlogged wilderness) valleys in Clayoquot Sound. For a general overview see this page. Friends of Clayoquot Sound, in alliance with other environmental groups, are working to secure permanent protection for these and all unprotected intact valleys in Clayoquot Sound, which add up to 74,000 hectares. Within the traditional territory of the Hesquiaht First Nation lie two forested watersheds, side by side. Satchie Creek and Hesquiaht Lake Creek both flow into the north end of Hesquiaht Lake, and together make up the northern extreme of Clayoquot’s intact forest. Much of the Hesquiaht region has already been devastated by clearcut logging and roads now criss-cross the scarred landscape. 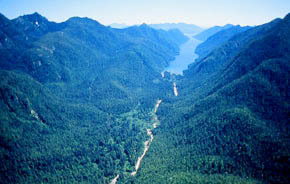 Satchie and Hesquiaht Lake Creeks stand at the threshold where industrial impacts end and old-growth rainforest begins. Satchie Creek (2,600 hectares) and Hesquiaht Lake Creek (1,510 ha) contain ideal habitat for the endangered seabird called the marbled murrelet, due to their proximity to the ocean and the presence of undisturbed old-growth forest. To date, Satchie Creek has narrowly escaped logging. Around the year 2000, the British Columbia government approved Interfor’s plan to build 22 km of logging roads and log 6 cutblocks in the valley, but the road building and logging never happened. Iisaak Forest Resources, which took over the logging tenure from Interfor, has also not moved forward with these plans. In 2005, Friends of Clayoquot Sound (FOCS) discovered that Interfor was building a road into Hesquiaht Lake Creek. FOCS generated market pressure and media coverage, causing Interfor to suspend road construction. But the next year, Interfor built the road and logged, impacting 1.2% of the valley’s area. The road is now deactivated and the valley is still considered intact, as it is less than 2% impacted by development. One of the most majestic areas in all of Clayoquot is the Sydney Valley and adjacent Pretty Girl Wilderness, located in the northern part of Clayoquot Sound. The Sydney Valley (5,670 hectares) is one of only five large primary valleys on all of Vancouver Island that has not been impacted by logging — the other 84 such valleys have been logged. A large, primary valley is one that is greater than 5,000 ha and drains directly into the ocean. This fact alone makes the Sydney Valley critically important for the preservation of Vancouver Island’s ancient forests, which have been severely degraded. Presently, only the very steep slopes of the fjord-like Sydney Inlet are protected (though they would not have been logged anyway due to terrain instability), while the dense temperate rainforest of the valley itself remains open to logging. The Pretty Girl Wilderness, to the east of the Sydney, consists of several intact watersheds including Pretty Girl Creek (3,760 ha), Easter Lake (1,780 ha) and others. This remarkable area is characterized by a series of rolling mountains with crystalline lakes nestled in green valley bottoms. Though remote, fringe areas of the region are frequented by kayakers where the ocean meets the forest, and by anglers who visit isolated lakes accessible only by floatplane. 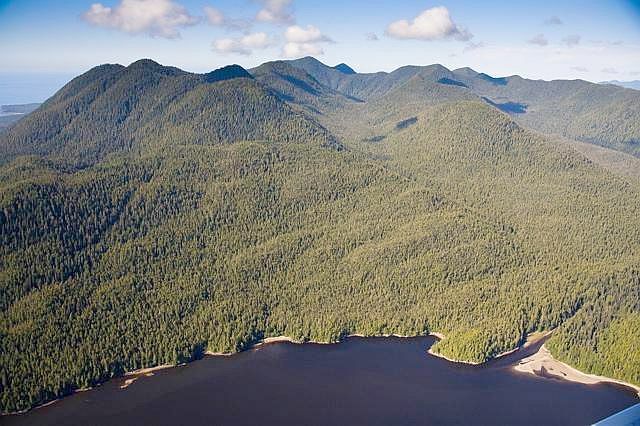 Together the Sydney and Pretty Girl Wilderness comprise a vast expanse of rare virgin rainforest, providing habitat for the 45 vulnerable, threatened or endangered terrestrial vertebrate species known to live in Clayoquot Sound. In 2004, due to pressure exerted by Friends of Clayoquot Sound, Interfor declared it did not intend to log in the old-growth Sydney Valley for at least five years, and that intent appears to be holding. In 2007, Iisaak Forest Resources acquired the logging tenure for Pretty Girl and half of Sydney, but has not been active there. At 7,380 hectares, the mighty Ursus River Valley is one of the largest unprotected watersheds in the Clayoquot Sound Biosphere Reserve. The Bulson Valley is adjacent to the Ursus and is similarly large at 7,210 hectares. Few people have ever visited these hard-to-reach valleys since the terrain is very rugged. This natural barrier to human encroachment has allowed the natural cycles of the forest to continue relatively undisturbed for millennia in these intact valleys, where bears and cougars exist never having seen a human being. The Ursus and Bulson are in the logging tenure of First Nations-owned Iisaak Forest Resources, which in 1999 signed a Memorandum of Understanding with environment groups not to log in these and other intact valleys. 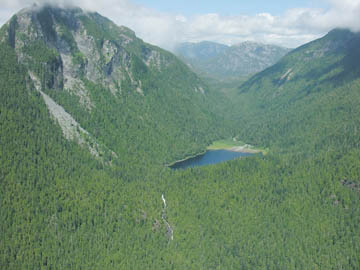 Clayoquot River Valley, photo by Jacqueline Windh, with support from Lighthawk.org. As one follows the coastal temperate rainforest north from California, the first large intact (completely unlogged) valley one encounters is the Clayoquot River Valley in Clayoquot Sound. 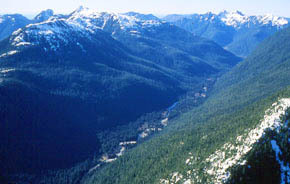 Clayoquot River Valley is 7,740 hectares in area and is ringed by mountains rising to 1,500 metres. 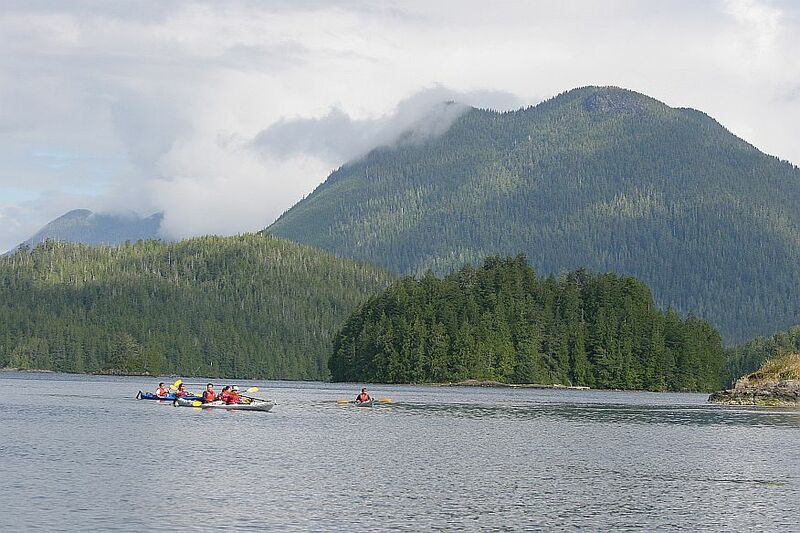 The river is 16 kilometres long and flows into the north end of Kennedy Lake, the largest lake in Clayoquot Sound. The valley itself contains several lakes — a series of small, high-elevation lakes in the headwaters, and Clayoquot Lake in the lower valley. The river and Clayoquot Lake are rich with five species of salmon, trout and Dolly Varden char. About 90% of Clayoquot Valley is covered with lush green temperate rainforest, consisting of western red cedar, western hemlock, yellow cedar, Sitka spruce and amabilis fir. The valley is wet! 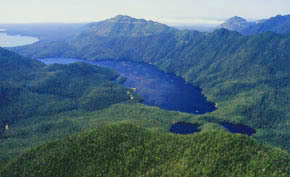 In 1995, a research station at Clayoquot Lake recorded 6,460 millimetres of precipitation (6.5 metres or 21.5 feet). This intact valley narrowly escaped logging. In 1989, blockade-threatening telegrams and letters sent by Friends of Clayoquot Sound stopped MacMillan Bloedel’s logging road just as it reached the rim of the valley. One third of Clayoquot Valley is now protected in provincial parks (established in 1993), including a portion of the lower valley and the treeless limestone Clayoquot Plateau. The remainder of the valley is in the tenure of Iisaak Forest Resources, a logging company owned by local First Nations. In 1999, Iisaak signed a Memorandum of Understanding (MOU) with environmental groups, defining the Clayoquot Valley as eehmiis (very precious) and off-limits to logging. In 2009, Tla-o-qui-aht First Nations designated Clayoquot Valley as a “leave as it is for now” zone in their Ha’uukmin Tribal Park. Although neither the MOU nor the Tribal Park have legal standing, they indicate First Nations’ desire to protect Clayoquot Valley from industrial exploitation. Flores Island’s intact valley #28, surveyed for logging in 2010, but still intact (unlogged). Photo by Tofino Photography (click to enlarge). At 15,400 ha, Flores is the largest island in Clayoquot Sound, and the largest intact (unlogged) island along Vancouver Island’s coastline. It lies within Ahousaht traditional territory. Flores is cloaked from ocean to mountaintop in ancient temperate rainforest that contains some of the densest stands of big trees in Canada and the world. Wolves, bears and cougars roam Flores; salmon spawn in its streams; whales, dolphins, seals and other marine life abound along its shores. You can see Mount Flores (880 metres) in the distance from Tofino’s waterfront. At the mountain’s foot are surf-fringed sandy beaches and rocky headlands where whales feed offshore, attracting whale-watching boats. The Walk the Wild Side hiking trail follows this rugged outer coast of Flores. Flores Island is 97% intact wilderness — the other 3% is 1980s logging by MacMillan Bloedel at the northwest corner of the island, and the First Nations village of Ahousaht at the southeast corner. Just over one-quarter of the island is protected in provincial parks on its west and south sides. Almost all the rest is in the logging tenure of Iisaak Forest Resources. In 1999 Iisaak signed a Memorandum of Understanding (MOU) with environmental groups, stating the company would not log in the intact areas within its tenure in Clayoquot Sound. However, in spring 2010 Iisaak began surveying for roads and logging sites on the east side of Flores Island, threatening the commitment it made in the MOU. In early 2011, the threat of logging on Flores was imminent. Pressure from FOCS and others helped hold that off, and the following year Iisaak withdrew its cutting permit application. A road-building permit remains in effect, but to date Iisaak has not moved ahead with road construction. Kayaking under Meares Island’s Lone Cone Mountain (click to enlarge). Meares Island lies opposite Tofino’s harbour.Its two forested mountains, Lone Cone and Colnett (721 and 792 metres, respectively), dominate the town’s scenic view. Tofino’s water comes from Meares Island streams. Meares is mostly in Tla-o-qui-aht traditional territory, with its fringes in Ahousaht territory. It is world-renowned for the monumental ancient cedar trees along its popular Big Tree hiking trail. Lemmens Inlet, which almost cuts the island in half, is a favourite spot for sea kayaking. The Tla-o-qui-aht village of Opitsat lies under Lone Cone and is visible across the water from Tofino. 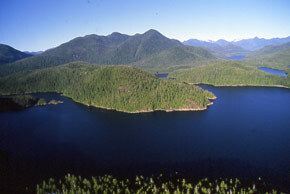 At 8,300 hectares, horseshoe-shaped Meares Island is the second largest island in Clayoquot Sound. Despite its proximity to Tofino and 99% of the island being in logging tenures, the ancient temperate rainforest that covers Meares is virtually intact. MacMillan Bloedel was about to log Meares in 1984, but a peaceful blockade by Friends of Clayoquot Sound and the Tla-o-qui-aht and Ahousaht First Nations turned back the loggers as they attempted to land. A court injunction obtained in 1985 by the Tla-o-qui-aht and Ahousaht First Nations protects Meares from logging or other development to this day, until treaty decides its fate. In 1984, Tla-o-qui-aht First Nations declared Meares Island a Tribal Park, reaffirming the declaration in 2014. The magnificent forest of Meares appears to be safe for the foreseeable future.